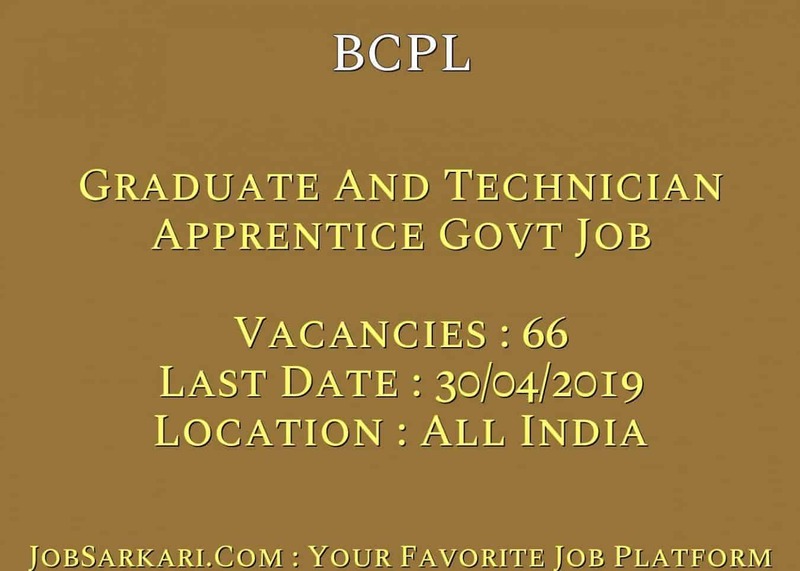 BCPL Graduate And Technician Apprentice Govt Job 2019 Syllabus Check Here. BCPL Notification is out. BCPL is recruiting for 66 Graduate And Technician Apprentice Govt Job Posts. You can check BCPL - Brahmaputra Cracker and Polymer Limited last date, download BCPL notification, visit BCPL official website and check other BCPL Vacancy details.Complete Vacancy and recruitment Details about 66 Graduate And Technician Apprentice Govt Job vacancies in BCPL are provided below by JobSarkari.Com only for you. Graduate Apprentice. Candidate Must Have Passed Degree in Engineering or Technology in Related Discipline And Having Graduate Examination of Professional Bodies As Mentioned in Notification. Technician Apprentice. Candidate Must Have Passed Diploma in Engineering or Technology in Related Discipline As Mentioned in Notification. Age Relaxation. 3 Years for OBC, 5 Years For SC/ST And 10 Years For PH. 1. Written Test/ Personal Interview. 2. Firstly Candidate Have to Click on the Registration Link And Enroll Themselves on NATS Portal As Given on our Website in Important links Section. 3. After Registration Candidate Have to Click on Apply Online Link As Given on Our Website. 5. Candidate Have to Upload Latest Photo And Signature As Prescribed Size And Format And Need to Save Data. 7. Online Applications Can be Submitted on or Before 30th April 2019. Q. What is the Last Date For BCPL Graduate And Technician Apprentice Govt Job Vacancy ? A. 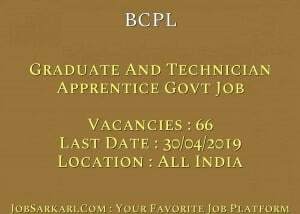 Last Date for BCPL Graduate And Technician Apprentice Govt Job Posts is 30/04/2019. Q. What is the Form Type of BCPL Graduate And Technician Apprentice Govt Job Recruitment ? A. The Form Type for BCPL Graduate And Technician Apprentice Govt Job Posts is Online. Q. How many vacancies are available in Brahmaputra Cracker and Polymer Limited Graduate And Technician Apprentice Govt Job Posts ? A. There are about 70 Vacancies in Brahmaputra Cracker and Polymer Limited Graduate And Technician Apprentice Govt Job Posts. Q. What is the Full Form of BCPL ? A. Full Form of BCPL is Brahmaputra Cracker and Polymer Limited .